The idea of taking a trip to Tasmania was conceived after our original plans to go to northern Thailand were thwarted by the travel-agency collapsing. 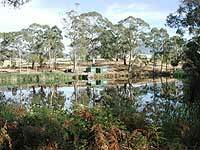 This and the possibility of terrorism and war in the middle-east made us turn our attention closer to home and as the Queensland climate can be rather humid and unpleasant in February we made a decision to go to visit the 'Apple Isle'. Currently (early-2003) there are many bargains to be found within Australian air-travel, we managed to book 2 mid-week flights on Qantas for AU$440 return and found car-rental for AU$42/day (unlimited mileage) with Thrifty. You may notice a minor deviation to the style of this trip-report from previous pages created by us, I have deliberatedly created this one with few bird-images attached but with hyper-linked references to our Tasmanian Bird Image Gallery. 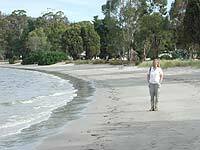 We left Brisbane at 07.00am on Tuesday 11 Feb with a short lay-over in Melbourne and arrived in Hobart at 12.00 midday, where the weather was a pleasant 20 degrees with little wind. Tasmania was, like most of Australia in the middle of a severe drought and we were surprised at the lack of 'green' in the landscape. From Hobart Airport we drove the short distance to Cambridge Airport and enquired about light-aircraft flights to Melaleuca in the South-west National Park to see the Orange-bellied Parrot breeding program. This is the only practical method of access as there are no roads and it can take about one week to walk in. We decided to take the half-day trip on the following day (currently AU$170 return each) and forego the full-day with lunch (AU$275 return). The Orange-bellied Parrot is one of the most threatened birds in Australia and their numbers currently run to approximately two hundred. We managed to traverse Hobart fairly easily and found ourselves in Kingston for lunch. Near Kingston is the Australian Antarctic Division HQ and closeby (near the Vodafone HQ) is Peter Murrell Reserve. 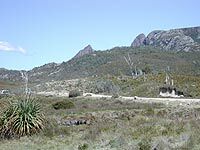 This was an excellent area visited by us on several occasions, here we saw several endemic species including Forty-spotted Pardalote, Dusky Robin, Tasmanian Native-hen and Black-headed Honeyeater. 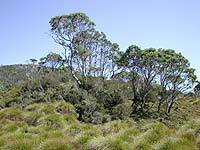 Other common species here and seen throughout the tour were Superb Fairywren, New Holland Honeyeater and Forest Raven. From Kingston we made our way to the Caravan Park in the quaint hamlet of Snug where we hired the last available cabin for 2 nights. 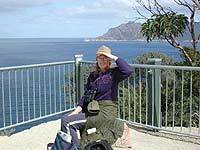 Near the beach were Kelp Gull, many Corella (of doubtful ancestry) and Dusky Woodswallow of the race cyanopterus. 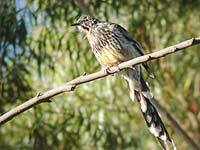 Back at the cabin we were entertained by another tasmanian endemic, the Yellow Wattlebird who certainly lived up to it's reputation as the 'vomit-bird' with it's curious call. 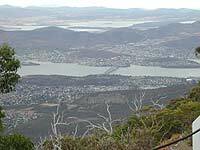 On Wednesday we decided to visit Mt Wellington which overlooks Hobart and make our way to Cambridge Airport for our trip to Melaleuca. 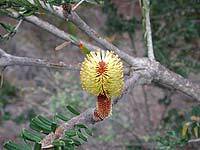 We took the Summerleas Road to Fern Tree and managed to get lost a couple of times but this was to our advantage as we came across Strong-billed Honeyeater and Green Rosellas. Whilst viewing these approximately 50 White-throated Needletails passed overhead, supposedly a rare bird in Tasmania we came across them again on a couple of occasions later near Strahan. At Fern Tree we searched unsuccessfully for Scrubtit but met some visiting british birdos and then received a call on the mobile informing us that due to poor weather our trip to the south-west had been cancelled. We re-arranged the flight for the following Monday. 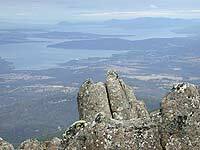 Driving from Fern Tree to Mt Wellington is definitely for those that require excitement! I managed to get to the summit car-park, but it was a white-knuckle experience. Fortunately it was well-worth it as the views from the top are amazing (and judging by the cloudy weather that shrouded the mountain later fairly infrequent). 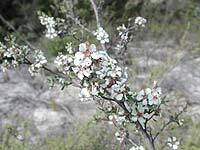 On the return we came across several bird-parties in the forest and had good views of Scrubtit and Tasmanian Thornbill. 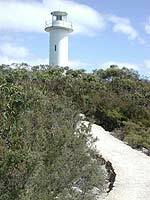 From here we visited Truganini's Reserve at Mt Nelson although we saw little except the 'Clinking' race of Grey Currawong. After a wonderful nights sleep I arose at 6am and realised that I was missing the un-missable 'friendly' soccer match between England and Australia live from London. Not to worry....there was a long delay before the kick-off due to security problems. Marie kindly agreed to have a lie-in and put the trip on hold whilst I witnessed the wonderful spectacle of seeing the 'Socceroos' thrash Beckham and his 21 team-mates. On 'yer Harry Kewell! At 9am-ish we returned to holiday mode and set off on the big-trip, we decided to drive to St Helen's on the north-east coast. As we had heard that historic site at Port Arthur was a venue that required more than one day to tour, we decided to limit our cultural ramblings to a visit to Richmond Gaol about 30 kms north-east of Hobart. This was an interesting site but also rather depressing, life must have been very difficult for convicts, settlers and indigenous people during Tasmania's early days. 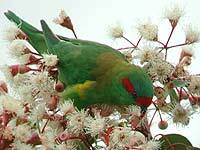 As we left the Gaol I could hear the sharp calls of parrots and expecting to find an aviary I was surprised to see several Musk Lorikeets in flowering ornamental eucalypts lining the street. These were the only wild lorikeets seen during our visit. At Swanport we found an inlet with hundreds of Australian Shelduck which we didn't encounter again during the trip. Towards lunch-time we arrived at Coles Bay, the HQ of Freycinet National Park. 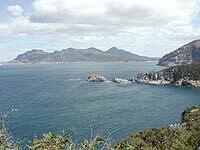 This is a spectacular area of rocky-coastline and impressive beaches, one of the rangers at the HQ told me to check out the 'Nuggets', two small islands just off Cape Toureville. As the weather was pleasant there were very few seabirds visible apart from some Short-tailed Shearwaters, Pacific Gulls and Black-faced Cormorants. We then took off for the last leg of the day's journey to St Helens and just a short distance from the town saw a small brackish lagoon with Hoary-headed Grebe, Musk Duck, Australasian Shoveler and many Black Swan. In the coastal heathland near St Helens we searched for Tawny-crowned Honeyeater and on the beaches Fairy Tern but saw neither (In fact, we failed to find either anywhere in Tasmania) However, on the roadside at dusk we saw our first Brush Bronzewing. The drive from Derby to Launceston was scenic but fairly uneventful and very few birds seen. After stopping for breakfast in Launceston we headed off west towards Cradle Mountain, near Carrick we saw a large flock of Banded Lapwing which were supposed to be very common in Tasmania but not seen before or after this sighting! 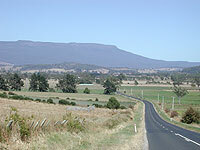 From the 'tourist' town of Deloraine the scenery began to get spectacular with nice views of the 'Great Western Tiers' the escarpments of the 'Walls of Jerusalem' and 'Cradle Mountain' National Parks. As the weather was warm and sunny we picked up a soaring Grey Goshawk of the 'white-phase' and a perched Australian Hobby although again they were to be the only ones of the trip. 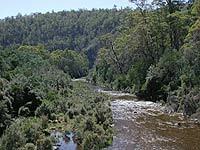 Passing through Mole Creek Karst National Park we were impressed with the (seemingly) unspoilt nature of the forestry and took a walk down a trail where we saw Satin Flycatcher, Olive Whistler, Strong-billed, Yellow-throated and Black-headed Honeyeaters and Pink Robin. In retrospect we probably should have given this area more time but we carried on to Cradle Mountain National Park. Arriving there on a wonderful afternoon we decided to take a drive to the lakes, but were thwarted by road-works which were in progress within the park. 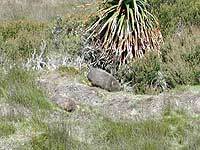 However we took a short walk through the button-grass near Cradle Valley and I managed to get a new mammal - Common Wombat! Two of these impressive animals were feeding near the creek in broad-daylight, I had always assumed they were nocturnal like most Australian mammals.